YANGON, Myanmar -- For years, one of 13 armed groups still to sign up to a peace process initiated by Myanmar's outgoing government says it daren't set foot in its homeland of western Rakhine State for fear of being annihilated by the Tatmadaw -- the country's 500,000 strong army. But that changed in March last year when communal violence in impoverished Rakhine led to members of ethnic rebel group the Arakan Army (AA) — the largest insurgent group in the state — returning to their homeland to fight for self-determination for the region's majority Rakhine Buddhists. “We believe our ethnic people need us. That’s why we returned,” Colonel Nyo Tun Aung, AA spokesman told Anadolu Agency by phone this weekend. He added that his troops had since clashed with government soldiers at least 30 times, and violent incidents appear to be on the rise. According to the government-owned New Light of Myanmar, on Dec. 28 several Tatmadaw personnel, including one commanding officer, were killed in sniper attacks in a clearing operation while "acting on intelligence that AA insurgents were preparing to invade”. "Many others were injured," the army-run Myawadi news agency reported, adding that forces had seized 1,250 rounds of bullets and 44 mines, and confiscated tents, rice and medicine. The Arakan Army is one of at least 100 rebel groups that have fought for self-determination against Myanmar's military since the country gained independence from colonial master Great Britain in 1948. 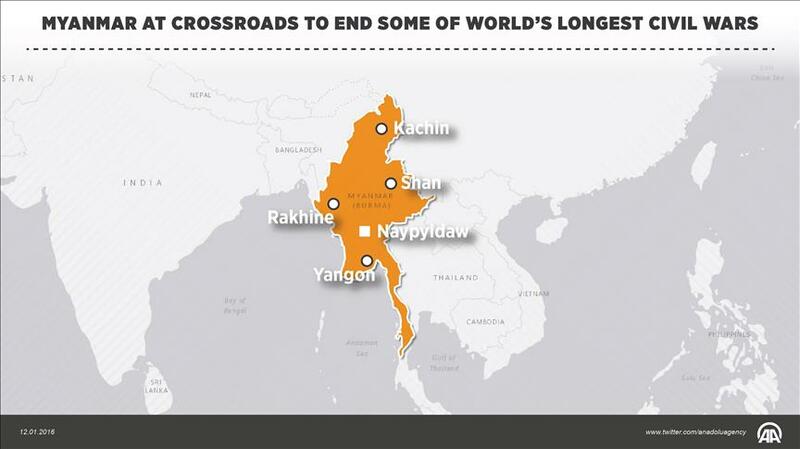 It was formed in 2009 by about 50 ethnic Rakhines in the Kachin Independence Army controlled area of northern Kachin state, and now has about 1500 fighters in Kachin, Shan and Rakhine states fighting for autonomy alongside other ethnic rebel groups. The soldiers who make up the army's fighting force are just one ethnicity from the complex mix that makes up Myanmar. Although the country has just eight major ethnic groups, there is another 135 sub-ethnic groups spread nationwide. 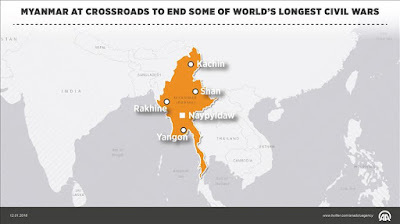 Much of the fighting began when Myanmar gained independence from Britain, with many left-wing insurgent groups forming armed wings in the belief that they were being unfairly excluded from running the country. In the 1960s -- when the central government refused to consider become federal -- many ethnic minority groups formed armed factions to fight for self self-rule and self-determination. By the early 1980s, many of the more politically motivated insurgencies had disappeared, leaving those which were ethnic-based to continue the conflict which has subsequently become described as one of the world's longest running civil wars. Today -- thanks to recent peace overtures -- just 21 major groups remain. Myanmar Peace Monitor’s website states that 15 have signed a bilateral ceasefire with the government at state-level, while six others continue to fight on. On Friday, however, state media reported that the military had pledged to eliminate the Arakan Army (AA) following nearly two weeks of fighting in which about 200 villagers had been forced to flee their homes and shelter in local monasteries. “The Tatmadaw will continue to launch offensive attacks against AA forces until the area is cleared of all insurgents,” the reports added. The announcement came just days before the National Union Peace conference is planned to take place Jan. 12 in political capital Nay Pyi Taw. The conference follows a historic peace agreement -- the Nationwide Ceasefire Agreement (NCA) - between the government and eight ethnic rebel groups in October last year. The government had invited 15 ethnic rebel groups to sign the NCA, however, seven groups -- including the most powerful Kachin Independent Army (KIA) -- refused to sign as six smaller outfits -- including the AA, ethnic Kokang rebel MNDAA and ethnic Palaung rebel group TNLA -- had been excluded. “The conference will discuss to draft the framework for political dialogue,” Hla Maung Shwe of the government-linked Myanmar Peace Center (MPC) told Anadolu Agency this weekend. “The current government just wants to lay a solid foundation of peace so the new government continues the political dialogue." On Nov. 8, Nobel peace prize laureate Aung San Suu Kyi’s National League for Democracy trounced the military-backed Union Solidarity and Development Party with 887 seats --- or 77.1 percent of the vote -- in an historic general election. Suu Kyi has since said that she will make peace a priority. “The Government also invites non-signatories to send representatives to the conference,” said Hla Maung, adding about 750 representatives from government, signatories, political parties and civil society organizations will attend the conference. However, most of non-signatories have shown no interest in the invitation. “Because the conference is based on the NCA that is not all-inclusive,” Naing Hantha said. However, two UNFC members -- the Karen National Union (KNU) and Chin National Front (CNF) -- who have signed up to the NCA will attend the Nay Pyi Taw conference. The UNFC has said, however, that it will negotiate with Aung San Suu Kyi’s government, which has said it will work to bring sustainable peace to the country. "The peace process is the first thing the new government will work on. We will try for the all-inclusive ceasefire agreement," Suu Kyi said in a public speech to mark Independence Day Jan. 4. "We can do nothing without peace in our country," she stated. Prominent author and historian Thant Myint U has described the current situation “as good as we’ve ever had, and as good as it’s going to get”. In an interview with Frontier Myanmar magazine, Thant Myint U -- one of four special advisors to outgoing President Thein Sein on the peace process -- suggests Suu Kyi’s government should be mindful about what’s worked and what hasn’t in other processes around the world. “We’ve taken big first steps but the light at the end of the tunnel is not really yet visible,” he underlined.